1. The photo above shows their 311EM “One4All” model disassembled. 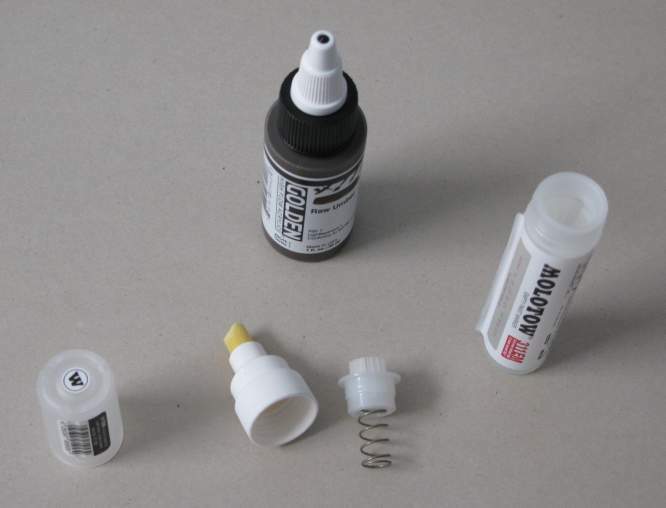 It consists of a plastic snap-on cap to keep the paint from drying out, a screw-on cap with a replaceable felt nib tip, a spring-loaded cap, and the empty marker tube that holds paint. 2. This picture shows the tube being loaded with paint. It holds about 15ml. 3. Next you replace the spring cap that snaps back in place. 4. Screw the felt tip cap back on. 5. 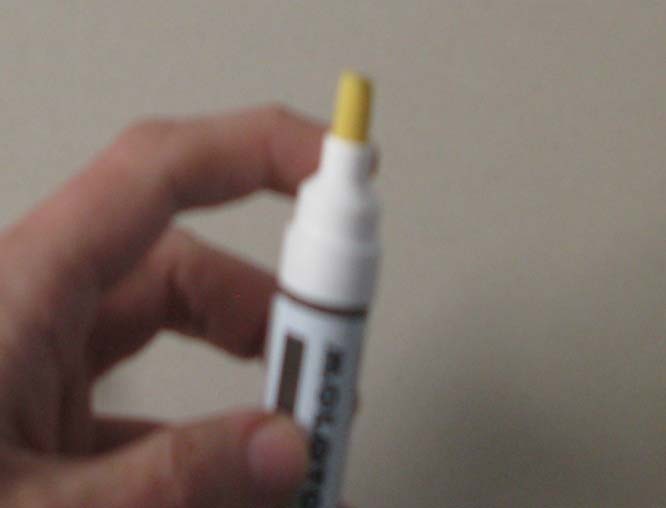 Press down on the marker until the paint fills the tip. This takes a few seconds with a new dry tip. 6. Start painting! 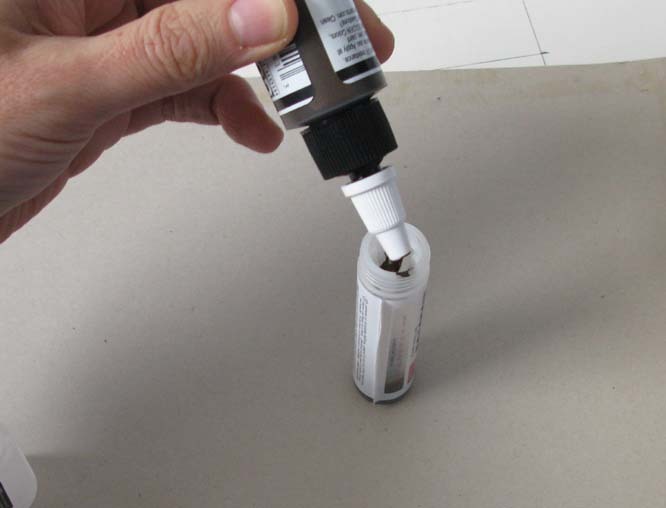 This acrylic paint takes only a few seconds to dry. It’s raw umber which is a fast drying pigment, so other pigments will dry a little more slowly. Inside the tube are two small plastic balls that you can shake to keep the paint properly mixed. After I brought this home, I found out that Molotow makes a special adapter called an “extension” that allows you to refill the marker more quickly and with less mess. 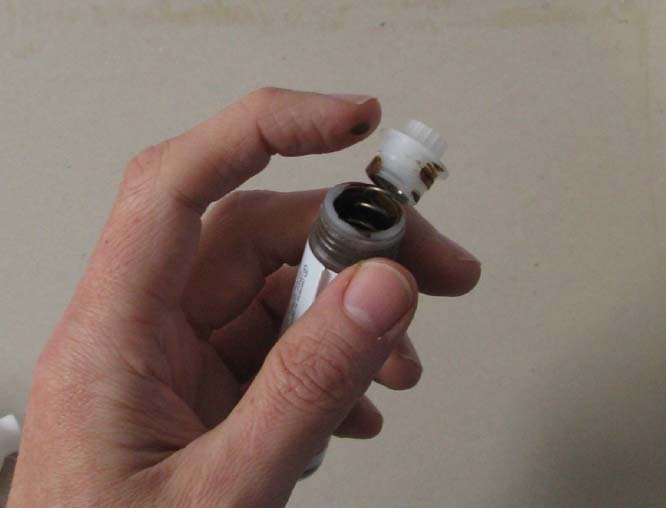 It screws onto the tube, and the spring cap and tip attach to its other end, so to refill the tube you only have to unscrew it without taking everything else apart. This tip is a chisel shape about 8mm wide. 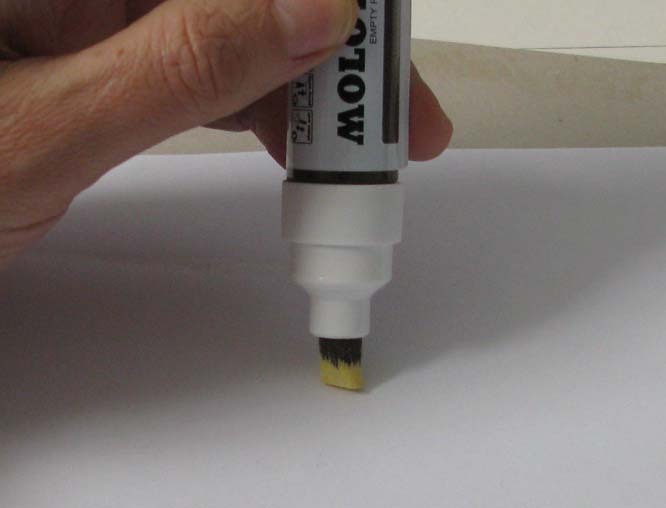 There’s another round tip available for this size marker that’s 5mm. They sell other size markers from 1 to 20mm. You’ll need one marker for each color you use, but the tube parts and tip can be washed. I’d recommend washing the tip at the end of the day. This marker cost me about $5 USD. I’ve seen online prices at about $3 each. I’ve also seen a “kit” set that includes 2 markers, 3 extensions, and several nibs for $17. The nib tips come in packages of 2 for @ $3. It should be possible to shape the tips with a knife, so I’ll have to pick up a couple extra to try that out. 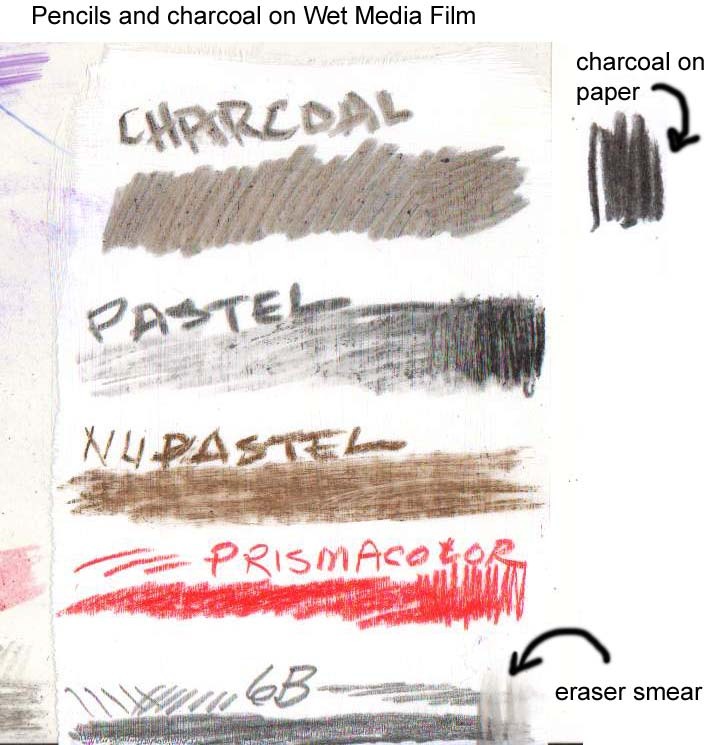 As a follow-up to my past review of this polyester surface from Grafix, Wet Media film, I wanted to demonstrate how you can prepare it to receive pencil marks by painting it with gouache. I used this process on the background area of my previous painting. By itself, the Wet Media film is too smooth and glossy to receive marks from a pencil. It just slides across the surface. Even the softer leads leave hardly any mark. 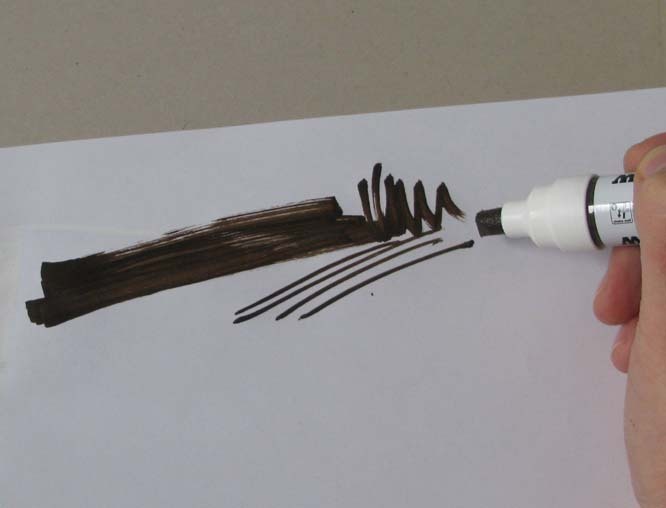 However, if you paint the surface with a thin layer of gouache paint, this will accept the pencil marks very well. 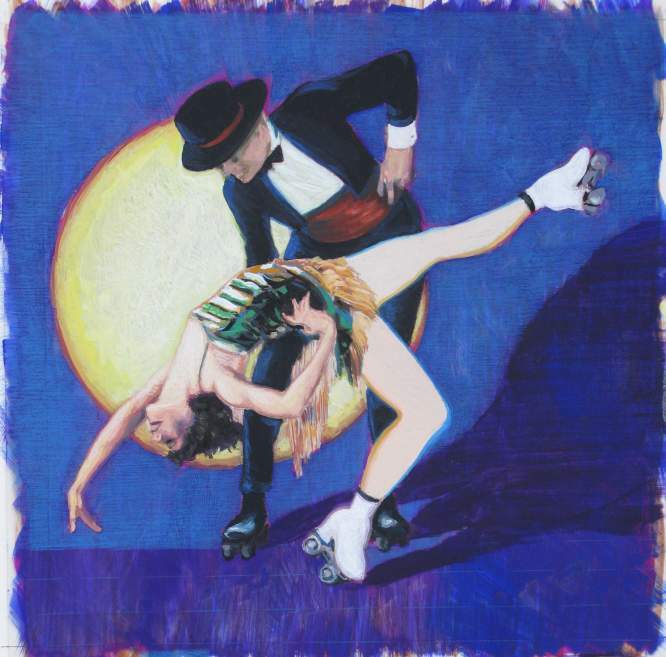 In the image above I used a range of several types of dry media to demonstrate how well they work on this film scrap painted with white gouache. It’s about 3 x 5 inches. I used a 6B graphite pencil, a red Prismacolor wax pencil, a stick of NU-Pastel chalk, and pastel; all of which worked very nicely. The charcoal, however, would not get dark at all, much like how it draws on frosted drafting film. Notice how dark it is on paper by comparison. The only negative with the other media shown here is that the marks won’t erase. You can lighten them by dabbing with a kneaded eraser, but wiping them with an eraser will only cause them to smear. The paint below can be scraped or wiped away with a damp cloth or cotton swab, and repainted if you need to make corrections, or you can paint over the marks. Of course, the gouache can be any color you wish, as well as multiple colors. You can use a light table to see through the paint if you wish, even the more opaque layers, so that you can work over a previous sketch. The film surface is more durable than paper, but it can be easily cut, creased, or dented, so careful handling is required. Here’s the final version of the new painting with the background all done; although, I still need to go back over it and clean up a few edges here and there. I may also tone down the texture of the circle to a more even gradient. I like painting on this film surface with gouache. Although pencil lines won’t draw on it very well, they will work on a gouache surface, as I’ve shown here with the blue watercolor pencil. I’ve stopped the process at this stage so you can see how I’m progressing. First, using a T-Square, I lightly drew dashed lines going horizontally about 1/2 inch apart to use as guides for keeping the shaded lines straight. You can still see some dashed lines on the bottom unfinished area. I’ll need to go back over it all again to smooth it out more. Vertical lines should help in that regard. 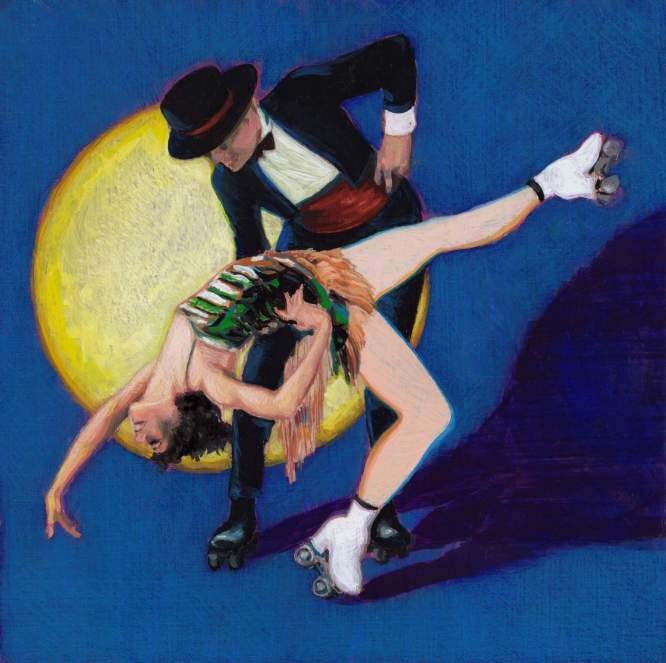 You are currently browsing the Artwork by D. B. Clemons blog archives for December, 2013.